Thursday March 30th 1893 We got the ironing done in good time this morning and Fanny went over the river in the forenoon. Soon after dinner she went up town with me and I got some new rugs and a table and chair. She went over to bring Lee to town and I arranged some things about the house while Josie went up town. I then called on the Irish family. I helped with the supper. spent the evening at home. 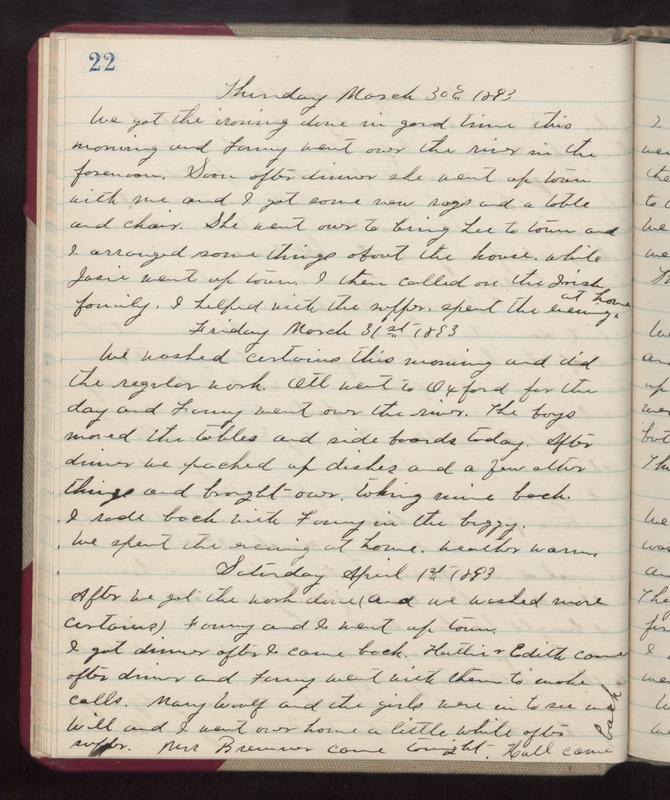 Friday March 31st 1893 We washed curtains this morning and did the regular work. Ott went to Oxford for the day and Fanny went over the river. The boys moved the tables and side boards today. After dinner we packed up dishes and a few other things and brought over taking mine back. I rode back with Fanny in the buggy. We spent the evening at home. weather warm. Saturday April 1st 1893 After we got the work done (and we washed more curtains) Fanny and I went up town. I got dinner after I came back. Hattie & Edith came after dinner and Fanny went with them to make calls. Mary Woolf and the girls were in to see [us?] Will and I went over home a little while after supper. Mrs Bremner came tonight. Hall came back.